Gregory Sowell, Principal Scientific Manager, Small Molecule Process Chemistry, from Genentech will be presenting on day 1 this May, and will be exploring the management of highly potent projects from early development stages. Dr. Sowell has over 25 years of pharmaceutical experience in small molecule process development and manufacturing. He has been at Genentech for the past 10 years where he leads a team of process chemists as well as heads the small molecule GMP API manufacturing facility. 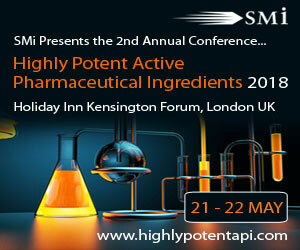 ‘Practical Approach to HPAPI Manufacturing in Early Development’ – Day 1 | 09:50. The opening presentation on day 2 will be presented to you by Vincenzo de Sio, Especialista, from Cristalia Produtos Quimicos Farmaceuticos, and will be looking into the waste and containement considerations of highly potent APIs. Alongside the risks which are associated with the handling and containment during the manufacturing of HPAPIs, there are also risk mitigation and containment measures which need to be taken post-production. Waste disposal of potent ingredients poses further issues and considerations, in terms of the handling of the hazardous residues. Further processes also need to be implemented in order to prevent environmental contamination. ‘Waste management for Highly Potent APIs’ – Day 2 | 09:10. For those looking to attend there is currently a £200 early-bird saving, ending February 28th.